I've been watching Martha Stewart for a long time now and I still learn something new when I least expect it and oftentimes, I see classics with a new, updated spin. Even with something as deeply rooted as cooking and baking, it evolves. Food can be both a history lesson and a new adventure. It truly nourishes us and brings us together; it's a beautiful thing! So there I was a couple of weeks ago, watching one of Martha's shows on DVR and not expecting to see anything unusual when my head snapped up at the sound of this saltine cracker crust. I had to try it. As I do so often, I divided the recipe in half (the recipe listed below is for the full-size tart). For me, that meant 2 ounces, or 17, saltine crackers, 4 tablespoons of butter, and 2 tablespoons of sugar into the food processor. You can imagine the salty-sweet vibe starting already. For some reason, I do not have a 6-inch tart pan so I grabbed a few of my mini's. One is about 4.5" in diameter while the other two I used are just about 4-inches wide. The larger has a removable bottom while the smaller two do not; thankfully, I find that tapping them slightly and inserting a sharp knife into an edge of the mini tart pans does the trick of getting the tarts to pop right out. The tart shells bake for about 20 minutes, or until lightly golden (they'll smell marvelous). Now, the interesting thing that I want to note is that about midway through baking, I noticed the tart crust had puffed up. Seeing that, I removed them from the oven and used a spoon to press the crust down before continuing to finish the baking. With that, they came out just the way I wanted. There was no mention of this need to press the crust down in the recipe but I recommend keeping an eye on it and doing so if necessary. Now, the filling...it is undeniably easy to make! I took half a can, or 7 ounces, of sweetened condensed milk and whisked in 2 egg yolks. Then, I whisked in 1/4 cup of freshly squeezed lemon juice from about 2 lemons (again, you can use lime or a combination of both) and it is done! Pour the filling into the cooled tart crusts and they are ready for the oven. It only took about 12 minutes for my filling to set and the tarts were ready to be removed from the oven and allowed to cool. Once fully cooled, chill it completely. I let it chill over night before digging in. To finish, a light topping of freshly whipped cream goes on top. You could add a sprinkle of flaky sea salt on top of that if you wish. I can see why those smart seaside restaurants designed this dessert. It's easy and casual, like summer and beach days should be, and the salty-sweet as well as tart, bright flavors are what people want in the summer. This tart crust made with saltines is wonderfully salty and sweet, with a shortbread-like texture. It's familiar yet different...with the crackers finely ground like this, I don't think I would be able to tell/identify that it was made with saltines but it would make total sense once the "secret" was revealed. Maybe I'll try a Ritz cracker tart crust next? This has me thinking about what other possibilities I've missed so far! Make crust: Preheat oven to 350 degrees. Place saltine crackers into a food processor and pulse until finely chopped. Add butter and sugar, and pulse to combine. Transfer crumbs to a 9-inch tart pan with a removable bottom and press into the bottom and up the sides of the pan. Bake until crust is golden brown, about 18-20 minutes. Check on the tart midway through baking; if it has puffed up, remove it from the oven and press down on it using a wooden spoon to flatten it again. Remove from the oven and let cool on a cooling rack. Make filling: Whisk condensed milk together with the egg yolks. Add citrus juice and whisk to combine. Pour filling into the cooled crust and bake until filling is just set, about 16-18 minutes. Let cool on a wire rack, then chill thoroughly in the refrigerator. Before serving, remove the sides of the tart pan and place tart onto a serving plate. Top with softly whipped cream, and a sprinkle of flaky sea salt, if desired. Awesome! I love that sweet tangy lemon curd filling! My husband likes this filling that's a bit thicker, sweeter because of the condensed milk. Me, I prefer a more tart lemon curd...but that salty-sweet crust is really amazing! Thanks, Balvinder. Hope you're having a nice, relaxing weekend! These tarts are so cute, Monica! I love that you used mini pans and saltine crust sounds so good! I am a big fan of anything sweet and salty and when you combine it with a lemon filling - oh my, sounds absolutely heavenly to me! That salty sweet combo on the crust was so good! Hope you had a great long weekend! This sounds terrific! Anything with lemon is appealing to me, and the saltine crust is new to me too. I'd definitely give this one a try! Glad to know it's not just me in the dark about this! The crust was my favorite part! I too keep saltines around for upset stomaches, and rarely take them out otherwise. I imagine the crust to be light with just a bit of salty flavor,which sounds wonderful with the lemon filling. No wonder you were intrigued and the thought stuck with you even after such an exciting vacation! Thanks for mentioning the need to watch the crusts for puffing while they bake. I have a bad habit of multi-tasking while things are in the oven and only look up when the timer rings! Thanks, Wendy. Glad to share and happy to try something new and end up with a tasty result. Hope you had a great long weekend! Beautiful tarts Monica! I adore the lemon filling and it must be great with that saltine crust. I used to make a corn pie with cracker crust - but forgot all about it. I'll have to dig it out of my pile one day. These are lovely and I am sure I would love it. Have a great week and hope your son enjoys being back in school. Thanks! Hi Tricia! Hope you had a great long weekend. I figure you've probably heard of/made/eaten this kind of cracker crust. The corn pie sounds amazing! I really enjoyed the crust and it was a new experience. : ) Talk soon! I am just drooling over this tart! Gorgeous tart Monica, I too find the crust very intriging, I bet it is perfect with the filling. Food like this is what inspirs me so, there seems to always be a new twist out there for us all to try. Great post. Thanks so much, Cheri. I feel so energized when I see something new/interesting and really makes me want to cook and share it with my family. And when it tastes good, it's another bonus. You know the feeling, I'm sure. Indeed very interesting using saltine crackers for tart crust, once over the intrigue, yes, I can see why it would taste nice, salty and sweet...thanks for the recipe Monica...and yes, always learning. Your tart looks awesome, and lemon is sure my favorite. It's great to discover something "new" or just a new twist...and there is just so much to try out there. Keeps us busy! Monica, this delicious lemon tart is making me feel weak in the knees! Seriously, lemon desserts are my favorite and top chocolate for me hands down. Get the kettle going I will be right over. Sharing! Hi Monica, I very much prefer tangy desserts to sweet ones (though chocolate ones are exceptions), so I know I would love this tart to bits! I love that chocolate desserts are the exception! ; ) I'm all about chocolate but lemon tarts are another one of my 'weaknesses'. Saltine cracker crust!? Wow. Now I am intrigued as well! This looks wonderful! I know, right! : ) It sounds weird and enticing all at once. Tasted great! 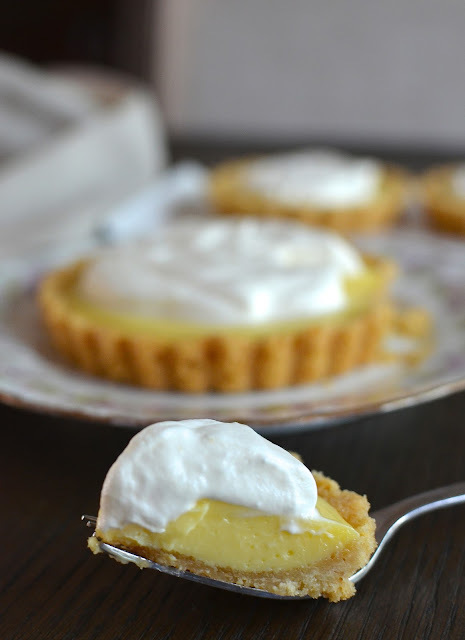 This lemon tart is proof that simple is best! This is beautiful. I am loving the idea of the saltine crust too. Thanks for sharing. The saltine crust was so worth a try. Thank you! This is such a great idea!! Just yesterday I was thinking what can I make a crust with something other than graham crackers?! Btw lemon tart is my favorite!! So excited to try this, especially the saltine cracker crust which is genius! That's what I thought...and it was totally worth making! Wow! What an amazing looking tart, Monica. Such an very interesting way of using saltine crackers for tart crust — super intriguing. Loving this genius atlantic beach tart. I'm glad others think it's interesting, too! Thanks, Anu. Gorgeous tart! Both the crust and the filling look amazing. 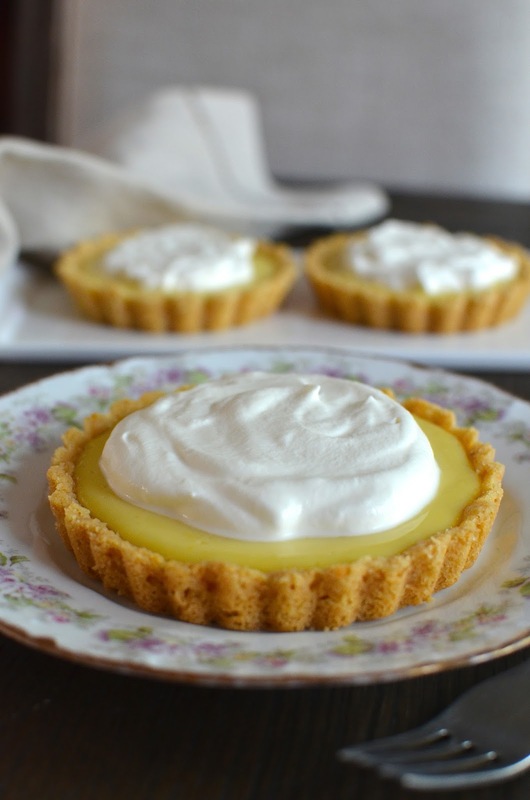 A lemon tart with a sweet-salty crust sounds like absolute Heaven to me. I love myself a lemon tart, too. And this crust was familiar yet different, a nice thing to try! I am so making these tarts! I am a sucker for lemon tarts and these ones look perfect, and I am so curious about the crust. I just hope that these saltines are that what I imagine them to be... some salty crackers? I had to try it, girl! So glad I did so I could satisfy my curiosity. Really enjoyed that crust! I just saw a version of this’s in the newest Martha Stewart magazine. Any thoughts on how you think matzah would substitute for the saltines to make it a Passover dessert? Thanks! That sounds like a great idea to me. I haven't done it, of course, but I would guess that the texture of the two are very similar and it would work. You might want to add a touch more salt...the salty-sweet is a nice combination. I would love to know if it works. Thank you.